As the full effects of Hurricane Sandy are only beginning to be counted, in terms of the tragic loss of lives, homes, and the economic devastation, it forces us to face the urgency of the task we face. 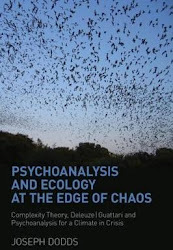 And that a psychological approach to climate change cannot limit itself to understanding the causes of eco-anxiety, denial, apathy and despair, but also the devastating psychological effects of environmental trauma, as explored in the upcoming issue of the Jungian journal Spring: A Journal of Archetype and Culture. Events such as hurricane Sandy can also be a severe test of our interpersonal relationships, in both positive and negative ways, as explored by Dr. Susan Kolod in A Date With Hurricane Sandy in terms of finding out more about the person we end up sheltering with from the storm, strengthening and renewing some bonds, breaking others. The emotional aftermath of events such as Sandy or Katrina can also effect us in several different ways, as Judith Graham writes in The Emotional Aftermath of Hurricane Sandy, feelings such as fear, despair, hopelessness, anxiety and panic can effect us in different ways. And the mental health implications can be very different in different groups of people. Following Katrina, for example, "the elderly had the highest mortality rates, health decline and suicide rates of any subgroup" along with "high rates of psychosomatic problems...worsening health problems and increased mortality and disability” (see the AAGP Position Statement). This can be heightened in this group due to the difficulties of talking about their feelings. Another groups at greater psychological risks are those with a history of trauma, as the hurricane can be experienced as a re-traumatization. If we didn't realise before, Sandy shows us the futility and dangerousness of framing 'environmental' issues as operating in a separate sphere to 'social' or 'psychological' issues, which can be more helpfully viewed as three interlinked ecological systems, and the need for detailed study of the psychology of climate change and ecological crisis. A new report on the largely unrecognised psychological consequences of climate change from the National Wildlife Federation. The impact of global climate change on Americans’ mental health has been largely ignored, even though the incidence of mental and social disorders will rise steeply if climate change is not curtailed, adding significant costs to the already $317 billion in annual mental health care expenditures and lost productivity in the U.S., concludes a major new study. “The greatest public costs could come from ignoring the effects,” the report concludes. Because extreme weather events and disasters will be more severe and more frequent, the U. S. will see a rise in illnesses like depressive and anxiety disorders, post-traumatic stress, substance abuse, suicide and violence. 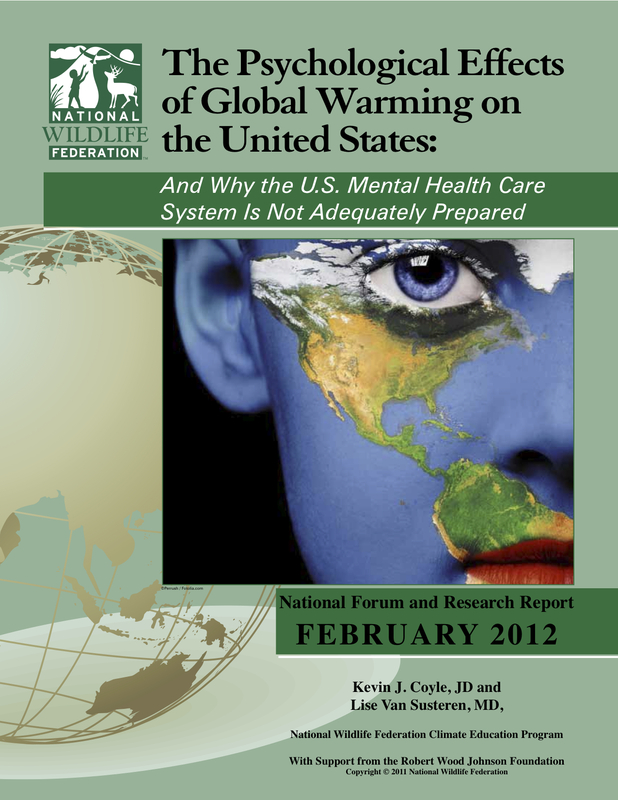 The Psychological Effects of Global Warming on the United States and Why the U.S. Mental Health Care System Is Not Adequately Prepared, authored by Kevin J. Coyle, JD, and Lise Van Susteren, MD, is the report of a March 2009 forum of health, and science and academic leaders from around the country. A majority of Americans, around 220 million, are likely to experience direct adverse effects, including psychological distress from climate-related events, especially vulnerable people like children and the elderly and the 60 million or one in four with pre-existing mental health conditions. “The consequences of failing to address climate change are quite serious for our economy, for our natural resources and for our psychological well-being. This ground-breaking study fills in a significant gap and highlights how failing to address climate change will bring more mental distress and disorders,” said Dr. Lise Van Susteren, MD, forensic psychiatrist and National Wildlife Federation board member. Scientists increasingly link natural disasters and extreme weather events to a warming planet. With 50 percent of Americans living in coastal regions and 70 percent in cities prone to heat waves and major inland cities located along rivers that will swell, most Americans are vulnerable. Economic sectors like agriculture, forest products and tourism could be disrupted, stressing families. Climate change will destabilize more countries which could draw the U.S. military into more conflicts abroad and exact a heavier psychological toll on troops and their families. forming mental health incident response teams. The authors challenge mental health professionals to teach the public about climate change’s effects. “The toll of climate change on our natural resources is well documented. This authoritative study sheds light on how climate change will affect the national psyche and calls on governments at every level to respond,” said Kevin Coyle, NWF Vice President for Education and Training. Climate change is expected to increase the incidence of mental and social disorders, including depression and anxiety, post traumatic stress, substance abuse, suicides, and violence. Vulnerable populations include children, the poor, the elderly, and those with existing mental health disorders (i.e. about half of the American public). The U.S. mental health care system is not prepared to handle the projected wide-spread psychological stresses of climate impacts. Better emergency management and disaster response training is needed. In order for the public to adopt climate solutions and support strong policies, they need to first understand the scale of the threat. The mental health community can help educate the public about the psychological impacts of climate change and communicate the health benefits of reducing carbon emissions. Health professionals can help shape messaging about the psychological implications of climate change and become a strong public voice for protecting the public, especially vulnerable populations.